Photo by Mary Levin. Courtesy of UW. I had a brilliant time at the Kodo Drummers of Japan show on Sunday. Meany Hall was packed to the rafters, as it usually is for a Kodo show, but this audience was distinctly different from the past three times. It comprised sizably of students but surprisingly also of many, many children especially in the front rows. At the beginning of the show, Artistic Director Michelle Witt came on to introduce the drummers and, looking around the hall, spoke with glee to the audience. Her voice crackled with a joy that was completely genuine. As the first half of the show began, the audience sat rapt at the extraordinary physical artistry of the taiko. I was myself impressed at the new direction of the Kodo troupe under their new artistic director, Tamasaburo Bando. The arrangement of their old work, “Monochrome,” was particularly brilliant. The troupe played it with less humor than on previous occasions but with a sureness and lightness quite impressive. As the intermission arrived, I felt confident that Kodo would continue to be a lively group, adapting to their future with aplomb. I had the same feeling about the UW World Series itself. I walked about the foyer during intermission, stretching my legs and watching the parade of people. I saw Ms. Witt in the foyer as well, walking around and leading a child gently by the hand. Minutes later she still wandered the foyer, talking to the children and various other patrons, making herself completely available and always smiling. This is Michelle Witt’s true quality as an artistic director. Beyond her obviously personable nature, she cares genuinely about that which she programs and never simply goes through the motions. I have seen her at every UW World Series event I have attended since she took over for Matt Krashan before the 2011-12 series. She always smiles, always says hello and always talks to people who come to the events–even me. Shortly after the announcement she would replace the retiring Mr. Krashan, I wrote that I thought the UW World Series was in good hands. I may have understated the case. I think Ms. Witt may become one of the most brilliant artistic directors Seattle has seen since Mark Murphy departed from On the Boards. In her first season, Ms. Witt maintained the UW World Series in a holding pattern, as expected. The roster that season consisted of many fan favorites, guaranteed crowd pleasers like Pilobolus, Shen Wei Arts, Ladysmith Black Mambazo and Garrick Ohlsson. Her choices for 2012-13 establish more of her personality. They are similar on the surface to last year’s but there has been a rather more adventurous streak to this list. For example, the President’s Piano Series appears to be typically “classical” (with all its connotations) on the surface. But beneath the surface there are changes. Christopher O’Riley’s somewhat conservative program of Liszt piano transcriptions was the official performance on the roster, but his program the day before, Out of My Hands, was anything but conservative. O’Riley’s transcriptions of Arcade Fire, Nirvana and Radiohead aimed to bridge the gap between popular and classical entertainment, but also to expand the audience for both. And not only the aesthetic audience: the Out of My Hands program also broke the economic barrier. Where tickets for the official O’Riley concert were $37-41, the tickets for Out of My Hands cost $15, and $10 for students. Such things are not accidental. Ms. Witt has always believed in education. The appearance of Christopher O’Riley on the UW World Series calendar is part of this belief. Ms. Witt has made a conscious decision to program work that draws in people from different walks of life: people who have an interest in other music, certainly, but also people who have a casual interest in classical music but are perhaps not willing or able to spend forty dollars. She is also unafraid of bringing in work unfamiliar to Seattle audiences in music but also in dance. Given the difficulties she has faced–of following one of Seattle’s legends in Matt Krashan, of dealing with a university education structure that is inherently conservative, and of truly fitting into Seattle’s artistic community at large–Michelle Witt has done a stupendous job so far in her position as executive director of Meany Hall. She has a wonderful personality. 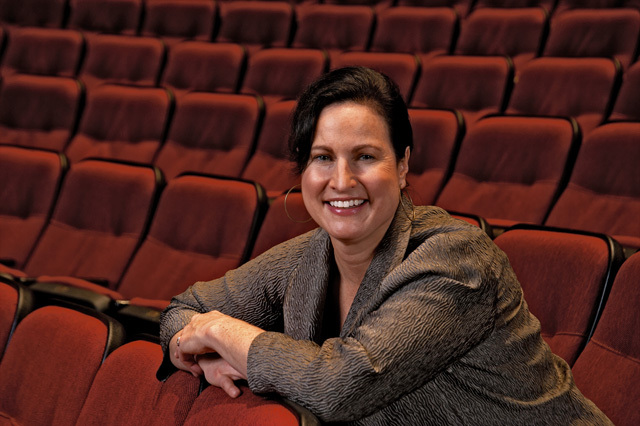 She shows exceptional dedication to the arts–and the audiences for the arts. If the next couple years continue the trend toward greater community outreach and bold artistic decisions, I will be a very happy Seattleite. I look forward to finding out.